This is Brand New iron raised garden bed not rust or rotting is a perfect yield blend for small patios, decks, condos and apartments, or anywhere you'd like to grow vegetables, herbs, or flowers. It's made from durable metal for long lasting utility. Stronger and stable rectangle appearance will not warp, more solid than wood. The elevated garden bed will provide adequate soil drainage and keep root development warm and strong to improve plant health. With 3 leaking holes, it will ensure plants get smooth breathe. Sturdy and stylish rectangle metal design with supporting frame. 39.4 inch length and 12 inch width of the bed provide ample space to place your plants and help them grow proficiently. 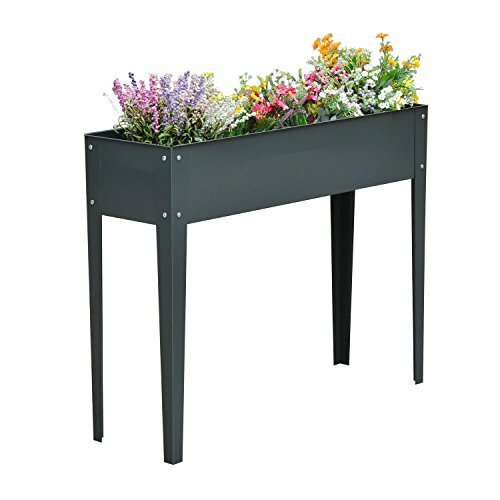 Stands at 31 inches tall, making it perfect for those who don't like to bend down or lean over while gardening. Durable and solid iron for long lasting utility. Surface treatment of spray-paint to prevent corrosion.